Ed Arends grabbed what he could in the night and fled his 5-acre property, lava oozing from a crack in his neighborhood on Hawaii’s Big Island. That was more than two weeks ago. He hasn’t been able to stay at his house since. As uncertainty drags on over what the Kilauea volcano will do next, those who were forced to leave their homes weeks ago are growing weary. More than 300 people were staying at three different shelters as of Saturday, Hawaii County mayor’s spokeswoman Janet Snyder said. Some 2,000 people who live in the Leilani Estates neighborhood, including Arends, and nearby areas were still evacuated after a lava fissure opened May 3. Officials ordered more people to evacuate Saturday when lava crossed a highway and flowed into the ocean, creating new health hazards. 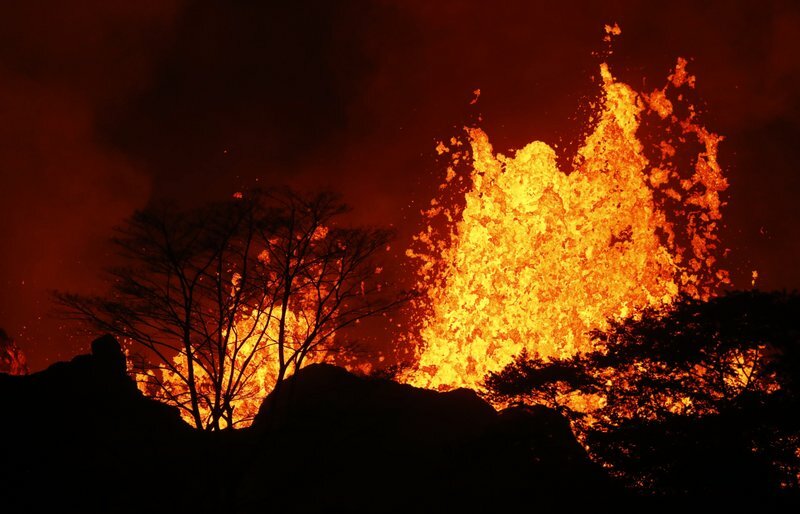 Lava has consumed more than 40 buildings. Those who live in the remote, rural Puna district on the slopes of the Kilauea volcano know the lava risks. Leilani Estates sits in a zone that the U.S Geological Survey deems to have the highest risk of a lava flow. Residents are allowed to return during the day to check on their homes. Some 25 miles (40 kilometers) away at the summit, there are intermittent explosions that send ash wafting over communities. It’s not known whether lava flows will keep advancing or stop, and new flows are likely. Steve Clapper stood in the rain outside a shelter where he and his mother have been staying since evacuating Leilani Estates. He sleeps in his truck with his dogs while his mother sleeps inside the shelter. The uncertainty has made Clapper want to get his 88-year-old mother, who has dementia and is on oxygen, off the island. “We don’t have any control over it, and this could go on for years,” he said. Don Waguespack, who co-owns Cajun Paradise Farms down a hill from where fissures have opened, evacuated to a small hotel room on the opposite side of the island. “We evacuated to Kona and felt so helpless over there, I think it was worse mentally for us than being here,” he said. So Waguespack returned, relieved to find his home on his 10-acre property still standing. Arends and his brother Mike Arends, who also evacuated from Leilani Estates, were grateful their houses were still safe. “It’s pretty early to tell what’s going to happen, things change on almost a daily basis,” Ed Arends said. Yet living out of bags, not knowing where your toothbrush might be at a given moment, is tiring and stressful for the brothers.